Monitoring current data from the driveline as well as the status of core components makes it possible to avoid failures and plan maintenance work effectively. This shortens downtime, lowers operating costs and increases safety on board and at the port, says ZF, who offers detailed status monitoring for marine propulsion systems. As specialist for marine propulsion systems, ZF can help shipyards, shipping lines and fleet operators manage their ships more efficiently and safely with its condition monitoring system (CMS). 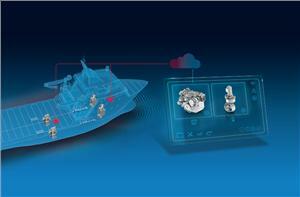 Depending on customer wishes, CMS can monitor the propulsion system in three levels. In the standard version, CMS determines typical parameters such as oil level and pressure, as well as input shaft speed, clutch condition and oil temperature, both before and after the cooler. The expanded monitoring of the second level measures oscillation in the system and the state of the oil with regard to particle and water content. At the third level, CMS measures the actual transferred torque in the drive system using dynamic load monitoring (DLM), which makes it possible to detect changes in the performance of the components early on. The condition monitoring system from ZF includes various sensors as well as an intelligent electronic evaluation unit. The OPENMATICS platform developed by ZF safely transfers the collected data and information to the ZF Cloud, where customers can access them. OPENMATICS allows for the integration of further data and systems to optimize the operation of ships and can therefore be expanded as needed. This lets operators recognize well in advance which components need to be replaced or require maintenance. Downtime and maintenance times are shortened, failures are avoided and the service life of the monitored systems and components is extended since repairs can be planned proactively. In the event of a failure, a display notifies the crew early on about the required measures. The crew also receives specific instructions to ensure operational safety. CMS is a further step which ZF is taking toward a smart marine propulsion system. This intelligent system bundles all important data to optimize ship operation, save costs and provide critical information in emergency situations.